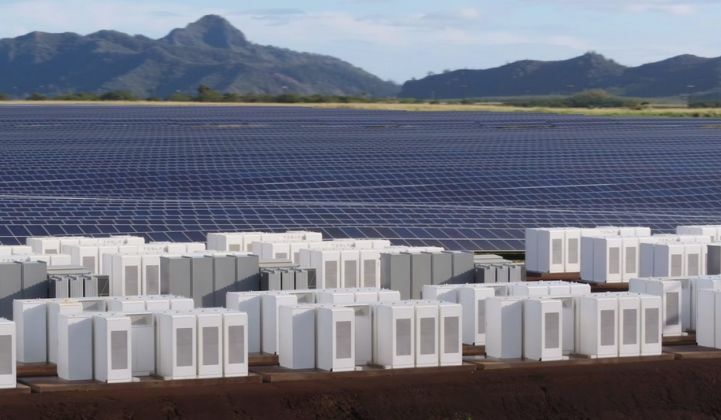 Lyndon Rive, president for global sales and service at Tesla's energy division, recently said that it makes "perfect sense to convert every island out there right now to solar and storage." Indeed, that is exactly what Tesla intends to do. 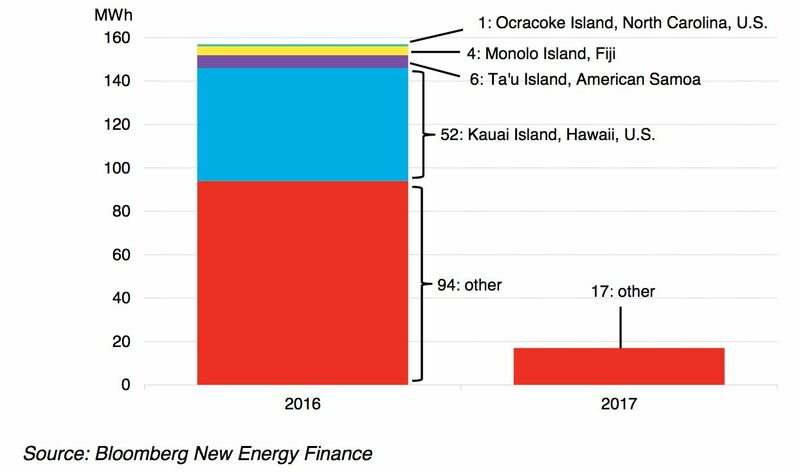 Island microgrids currently represent 36 percent of Tesla's total power storage capacity deployed to date, according to a new report from Bloomberg New Energy Finance. Since November 2016, the company has deployed first- or second-generation versions of its grid-scale Powerpacks on five islands, researchers found. Four of the islands are in the Pacific: Ta’u in American Samoa, Monolo island in Fiji, and Kauai and Oahu islands in Hawaii. The fifth project was on an island in North Carolina, where Tesla’s first-generation Powerpacks were deployed in a solar-plus-storage microgrid to support the island’s 3-megawatt diesel generator. BNEF’s Energy Storage Project Database tracked a total of 157 megawatt-hours of energy storage capacity installed by Tesla in 2016 and 17 megawatt-hours installed in the first quarter of 2017, for a total of 174 megawatt-hours deployed in recent months. "The recent projects suggest that megawatt-sized island microgrids represent an important component of the company’s grid-scale storage strategy," the report states. However, "There is little to suggest that Tesla is seeking to become a full-service microgrid operators in underserved regions," the authors added. "Most of the islands where it has deployed its technology to date are well developed and served by local utilities." Tesla does not appear to be installing distribution grid technology or managing retail electricity operations, both of which are crucial to the successful deployment microgrids in frontier markets (as we've covered). Tesla is hardly the only company targeting the island microgrid market. Energy storage players Fluidic Energy and Electro Power Systems also deployed new microgrid projects in the first quarter of 2017, according to BNEF. In addition, the International Renewable Energy Agency (IRENA) and the Abu Dhabi Fund for Development (ADFD) recently committed $44.5 million for four projects in the Pacific and Africa, including 30 megawatts of new capacity for islands announced in January. BNEF tracked 48 megawatts of new generation assets commissioned or announced in Q1 of this year in the Pacific and Indian oceans regions alone. Back on the mainland, technology giants have figured prominently on the microgrid map, including Schneider Electric and Engie, which signed an agreement last month to improve energy access in off-grid areas of Southeast Asia. Engie also signed an agreement with Electric Vine Industries to jointly develop, finance, build and operate solar-powered microgrids for 3,000 villages in Papua, Indonesia. The project is expected to reach 2.5 million people for a total investment of $240 million over the next five years. Internet tech giants are also getting in on the action. Last month, Facebook and Microsoft joined with investment firm Allotrope Partners to launch the Microgrid Investment Accelerator, which will mobilize roughly $50 million between 2018 and 2020 to expand energy access in parts of India, Indonesia and East Africa -- with an estimated addressable market of 212 million people. In a study released along with the accelerator announcement, Allotrope found that market players in the three selected geographies are on track to develop 7 megawatts of microgrids -- serving approximately 300 villages, and 63,000 homes and community organizations -- within 12 to 18 months. Assuming half of that pipeline actually gets commissioned, the market would need $20 million to develop the projects this year. By 2020, that financing requirement could climb to more than $100 million. For Facebook, which is providing seed financing for the investment accelerator, deploying microgrids in frontier markets is about supporting energy-efficient systems and expanding connectivity around the globe. "Ultimately, we anticipate these types of partnerships will assist in broadening access to our connectivity efforts," a spokesperson told GTM. For a number of reasons -- from technology cost declines, to new market entrants, to policy shifts -- BNEF notes "2017 is shaping up as an important year of groundwork-laying for microgrids in remote or unelectrified regions of the world."